It is suddenly made possible for scientists all around the world to investigate the relationship between the structure and function of molecules during a chemical reaction. 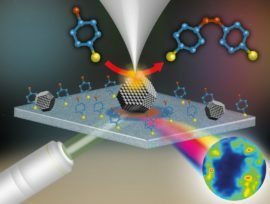 In Nature Protocols, Katinka Wondergem (MCEC linked PhD), Bert Weckhuysen and other chemists of Utrecht University, and chemists of the National Physical Laboratory (NPL) in the UK, are publishing a detailed protocol for tip-enhanced Raman spectroscopy as an analytical technique. In another journal, they are describing a technique to produce stable probes for such measurements. You can read the full press release by Utrecht University here.